Repenteth Thou of Nasty Fonts! Today I saw what looked like a father-and-son duo standing on a street corner holding up large signs that said, “Jesus is the Way, the Truth and the Life” and “Believe in Jesus.” They weren’t yelling or screaming, just holding up their signs for drivers to see. In fact, the teenager looked like he was kind of trying to hide behind the sign. No heavy-duty “turn or burn” messages… and certainly no mixing of gospel and empire, as depicted to the left. 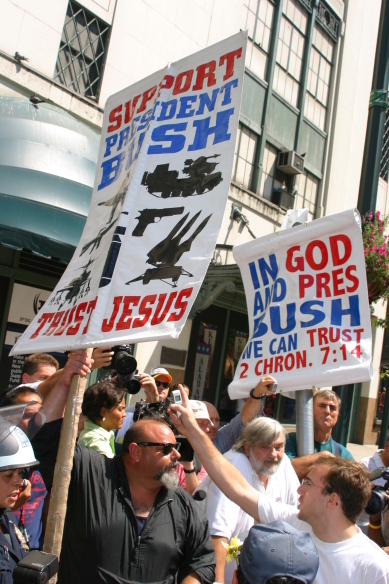 It takes some seriously willful ignorance not to realize the crazy ridiculousness of holding up a sign that says “Trust Jesus” along with clipart (or is it some crazy fundie dingbat that I haven’t seen yet?) of a handgun, tank, and anti-aircraft missiles. And is that a dude high-kicking in the upper left-hand corner? Other than their theology, missiology, and methodology, the thing that drives me nuts about these kinds of signs are the fonts people use to promote their message — usually something clunky like Impact or Varsity (for that eschatological rah-rah flair). While I might not be as upset as some people are about certain fonts (Comic Sans, in particular), I believe that fonts matter. And not only to us font-nerds, but for legibility, to convey a particular ethos or vibe, and maybe even to get better grades. It’s time to upgrade to “Repent 2.0” signs. Signs are good. However, we should spend some time with God and make sure of what He would have us to put on them. In some cases, it does more harm then good. I like the ones that you mentioned in the first part of your post.